Creating the Universe: Depictions of the Cosmos in Himalayan Buddhism, which will be published by the University of Washington Press, presents an interdisciplinary analysis of Buddhist depictions of the cosmos across two thousand years of history in India, Nepal, and Tibet. In chapters that deal with primary texts, ritual ideologies, material practices, and art and architectural history, the book reveals the immense significance and complexity of cosmological thinking in Himalayan Buddhism. Across the Himalayas, ubiquitous portrayals of the universe provide versatile frameworks for expressing disparate ideas about everything from scholastic knowledge to ritual practice, poetic rhetoric, and architectural space. Like geographic maps, which can vary to communicate surface topology or weather patterns even as they describe the same places, Buddhist depictions of the world change according to function. By characterizing inhabited realms in distinct ways, these representations help define the scope of human experience. Bridging disciplines, the book incorporates the perspectives of many fields, including Buddhist studies, religious studies, art history, and area studies. The author also provides numerous explanatory diagrams to bring together the varied logics of many traditions. By grounding cosmological thinking in specific and diverse examples, Creating the Universe retrieves the study of cosmology from theoretical debate and relative obscurity. Employing comparisons across medium, function, culture, and history, the work exposes cosmology as a fundamental mode of engagement with numerous aspects of religion, from preliminary lessons to the highest rituals for enlightenment. The AIIS Book Prize Committee, chaired by Professors Anand Yang and Susan S. Wadley, praised the manuscript as “an innovative and compelling interdisciplinary study of cosmological thinking in a variety of contexts, including texts, ritual practices, images, and architectural spaces across the Buddhist world of the Himalayas,” and noted that its publication will make a significant contribution to the disciplines of Art History and Religious Studies. Eric Huntington is a postdoctoral fellow at the Ho Center for Buddhist Studies at Stanford University. 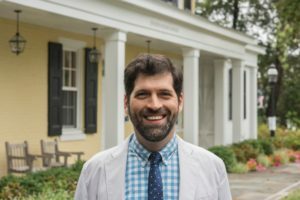 Prior to this appointment, he served as a Cotsen Postdoctoral Fellow in the Society of Fellows in the Liberal Arts at Princeton University and earned a Ph.D. from the University of Chicago. His research examines various relationships between art, ritual, and philosophy in the Buddhist traditions of India, Nepal, and Tibet. In other writing, he has addressed the role of images in illustrated manuscripts, ritual structures hidden within literary texts, and interdisciplinary approaches to Buddhist visual culture. His next large project will shed new light on Buddhist notions of the materiality of sacred objects. Huntington also teaches on diverse topics in Buddhist studies and Asian traditions, including visual and material culture, literature and narrative, identity and gender, cosmology, pilgrimage and sacred space, and tantrism. Claiming the State: Active Citizenship and Social Welfare in Rural India will be published by Cambridge University Press in the summer of 2018. It explores the conditions that shape whether and how citizens in rural India make claims on the state for social welfare. The book’s central questions—who makes claims on the state for social welfare, how, and why?—will be important to those interested in welfare provision, citizenship practice, and local governance. Citizens around the world look to the state for social welfare provision, but often struggle to access essential services in health, education, and social security. This book investigates the everyday practices through which citizens of the world’s largest democracy make claims on the state, asking whether, how, and why they engage public officials in the pursuit of social welfare. Drawing on extensive fieldwork in rural India, the author demonstrates that claim-making is possible in settings (poor and remote) and among people (the lower classes and castes) where much democratic theory would be unlikely to predict it. Examining the conditions that foster and inhibit citizen action, she finds that greater social and spatial exposure—made possible when individuals traverse boundaries of caste, neighborhood, or village—builds citizens’ political knowledge, expectations, and linkages to the state, and is associated with higher levels and broader repertoires of claim-making. The book is accessible not only to academic audiences in the social sciences but also to policymakers, NGO staff, and journalists. 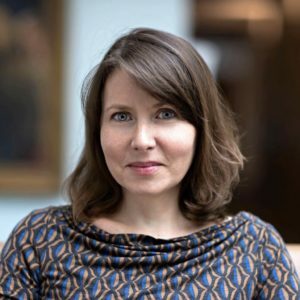 Gabrielle Kruks-Wisner is an assistant professor of Politics & Global Studies at the University of Virginia, where she teaches classes on international development, local politics, and state-society relations. Her research is focused on local citizen-state relations and their consequences for human development and social welfare, with a regional focus on India. A first body of recently completed work (appearing in the journals World Politics and World Development) investigates the conditions under and pathways through which citizens make claims on the state for essential social services. In addition to Claiming the State, a second body of work-in-progress examines strategies to increase official accountability and to mobilize more effective citizen action. Current research includes studies of citizen-police relations, grievance redressal, and citizen journalism in India. Her research has been supported by the Fulbright Program, the National Science Foundation, the Boren Fellowship, and DFID’s Economic Development and Institutions program. Prior to joining UVA, she was an Academy Scholar at the Harvard Academy for International and Area Studies, and an assistant professor of Political Science at Boston College. She received a Ph.D. in Political Science and Masters in International Development & Regional Planning from the Massachusetts Institute of Technology, and a B.A. in Sociology/Anthropology from Swarthmore College. She has also worked in Latin America and sub-Saharan Africa on issues related to economic and social rights, service delivery, disaster risk reduction, environmental sustainability, and local politics.